No tree is safe in this tricky wood chopper. Environmentalists...beware. Upon first glance, Jack Lumber seemed like a game we should've backed 100 percent, thanks in large part to humor normally reserved for Adult Swim's iPhone and iPad titles. Here's a rather large and beefy lumberjack wielding an axe, out to exact revenge on a bunch of trees after one of the suckers killed his grandma. Syrup power-ups? Different beards to wear? The ability to poke animals around a log cabin? Sounds like the guiltiest of touchscreen pleasures. The reality, though, is a bit sobering. By all accounts, Jack Lumber is a well-made video game, but not a great one. 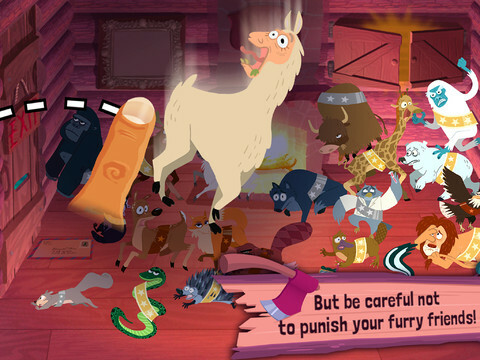 It's Fruit Ninja with bullet time, except the developers at Owlchemy Labs call it LumberTime. 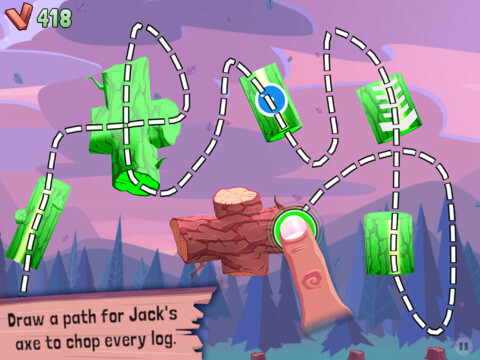 Instead of fruit, there are pieces of wood, and your job is to press the screen to slow the logs down temporarily, then draw lines through them all, whereupon which Jack does his thing. Granted, it's more complicated than that. Some logs require a specific number of cuts, while others come in L and T shapes, forcing you to guide a finger in various directions, all the while doing your best to avoid the innocent woodland creatures that sometimes fly across the screen. Not a bad concept, really, and to be fair, the game's somewhat enjoyable. It just has that "been there, done that" vibe that transcends quirky shenanigans. Sure, the letters that Jack receives made us grin, and the option to fill the cabin with animals is a cool touch, but come on. There's only so much wood we can chop before the whole experience makes us sleepy. Not only that, but the weak chopping sounds do nothing for us. Don't get us wrong. Jack Lumber packs enough content and line drawing mayhem to warrant a look, especially from players that enjoy over the top characters. After weeks of hearing about this game, however, we expected something more exciting. Instead, it made us yawn. What's Hot: Humorous presentation, syrupy upgrades, tricky line-drawing mechanic. What's Not: Drawing lines quickly grows boring, in-app purchases seem excessive.